Ever since the avian H5N1 virus began its big move in 2005-2006 - where it abruptly spread out of a handful of southeast Asian countries to more than 50 new countries in Europe, the Middle East and Western Africa - there has been a long (and often bitter) debate over the role of wild and/ migratory birds in the spread of avian flu. Governments and poultry producers have often been quick to blame migratory birds when outbreaks occur, while conservationists have pointed fingers directly at the poultry producers, citing crowded factory farms, poor biosecurity, and poultry transportation and smuggling as the prime factors. Not having a bird in this fight, it seems perfectly reasonable to me that both play major roles in the spread of avian flu. But there seems little in the way of common ground for these opposing groups. Typically, spread of HPAI virus is via contaminated poultry, poultry products and inanimate objects although wild birds may also play a role. d. recognise that focussing attention on wild birds, to the exclusion of other potential viral vectors, can misdirect critical resources away from effective disease control and result in continued spread among poultry populations and economic losses to farmers and national income, as well as negative conservation outcomes and loss of biodiversity. The then went on to present their rationale for why avian viruses are unlikely to have traveled rapidly via birds from east to west when migratory routes are predominantly north-south corridors. In all fairness, I would point out that these migratory routes overlap, which would seem to afford ample opportunities for lateral movement of viruses. But at the same time we are seeing nearly 700 poultry farms in Taiwan battling a multi-subtype outbreak of HPAI H5 - and while likely introduced to the island by migratory birds – it stretches credulity that infected wild birds paid personal visits to each of them. Once introduced into a region’s poultry, outbreaks often appear to be exacerbated by lapses in biosecurity and the movement of poultry products, transport, or personnel. Something we looked at last November in Bird Flu Spread: The Flyway Or The Highway? 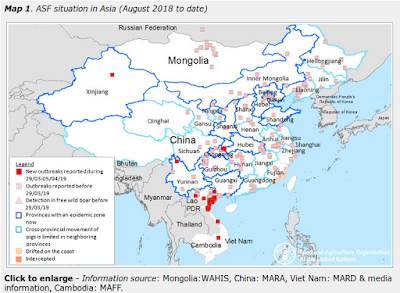 In November and December 2014, highly pathogenic avian influenza (HPAI) viruses of the H5 subtype originating from China were detected in poultry and wild birds in various countries of Asia and Europe, and, for the first time, in North America. These incursions of newly emerging HPAI H5 viruses constitute a threat to animal and potentially human health and raise questions about the routes of transmission. Migratory birds may be spreading viruses that cause bird flu around the world, say scientists. "More poultry outbreaks could occur in the future, especially in countries that are ill-prepared," a team led by Dr Ron Fouchier wrote in the journal, Science. "Despite the currently low public health risk, the outbreaks should be monitored closely, given that several animal species are susceptible and that influenza viruses are generally unpredictable." Wild birds with long migratory routes should be monitored for exposure to H5N8 and control measures in poultry should be updated, as they appear to be "insufficient", they added. Scientists are also investigating other ways that bird flu viruses can spread around the world, including through illegal poultry trade and contamination of vehicles or equipment. The BBC story goes on to point out that the science isn’t settled, and the European Food Safety Authority recently stated the route of spread of the disease remained uncertain. The H5N8 virus originated in Asia and spread rapidly along wild bird migratory pathways during 2014, including the Pacific flyway. In the Pacific flyway, the H5N8 virus has mixed with North American avian influenza viruses, creating new mixed-origin viruses. This is not unexpected. These mixed-origin viruses contain the Asian-origin H5 part of the virus, which is highly pathogenic to poultry. The N parts of these viruses came from North American low pathogenic avian influenza viruses. Somehow, despite the preponderance of evidence, I suspect this debate is nowhere near being settled.